Here you can find details of each new release the JobFLEX team provides to our users. What’s New in the JobFLEX Web Release? … Create Quotes and Invoices from your desktop! It’s finally here, our most requested feature, everything you can do from the app is now available on our fully revamped website. Type up your detailed item descriptions and modify quotes and invoices right from your desktop or laptop computer. Export Reports: when you run a report on the website, you can download the report using a link at the bottom of the page. Many of the reports on the website have more information than what was available in the app, and if you download the report some have even more details. Import/Export Items List: from the website you can download an export of your current items list, modify it from excel or create a list of new items to import. When importing you can choose to add to, or replace, your existing items list. Pro Users will have access to a two new features as well, Marketing Sources and Syncing with Google Calendar. Both of these features are available in the additional information section of the customer details. When managing customers from the customer list, you will be able to assign a Marketing Source to them to keep track of which marketing campaigns are selling the most quotes. 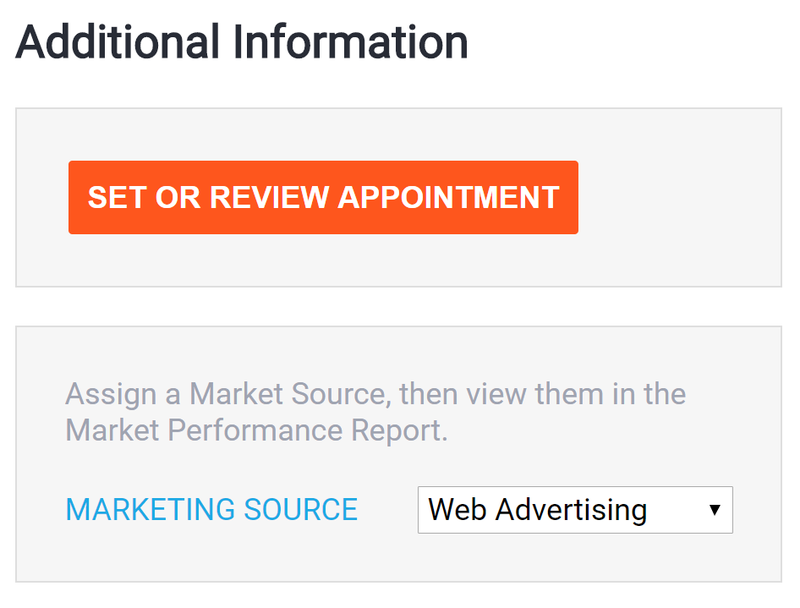 When a quote is created and sold for customers with an assigned marketing source, you can view the quote and sold percentages of each source via the new Market Source Report. 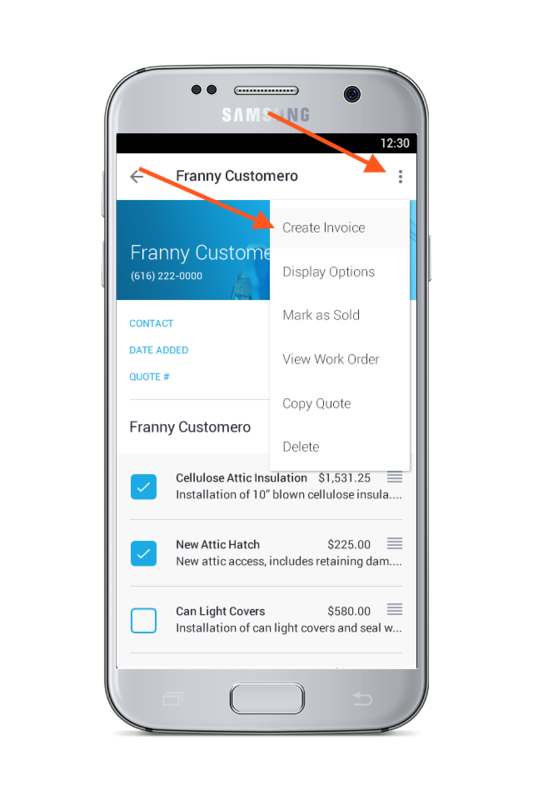 When viewing customer details, you can schedule a new quote which allows you to assign a salesperson and set the date the salesperson should meet with the customer to fill out the quote. This will create a quote in your quote list, and schedule it on the provided date. If you decide to sync with Google Calendar, you can sync the calendar details and include the job site address so that from a phone, the salesperson can just click on the appointment from their calendar and receive directions to the job location. If the job site location is different from the customer address, make sure to fill it out and then set the appointment again to update the Google Calendar Entry. What’s New in JobFLEX 8.2.4? … Settings and Performance Updates! 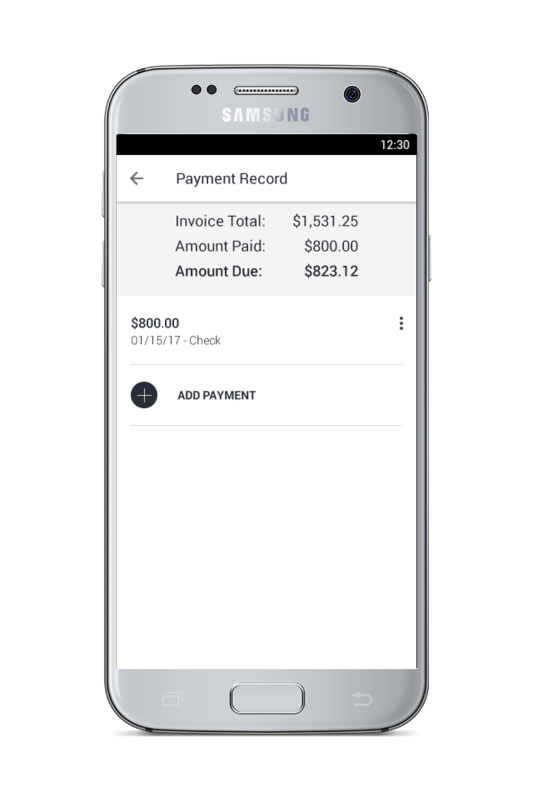 There have several changes since the Invoicing in 8.1, many of these features were improvements to performance or small features requested by our users to make the app easier to use. JobFLEX has been fully translated into Spanish, the language and country selection will default to whatever your device is currently set to, but it can be changed by going to Settings > App Settings (Formerly Document Settings). Country can also be set which will determine the currency and date formatting the app will use. Right below country selection is the archive setting. 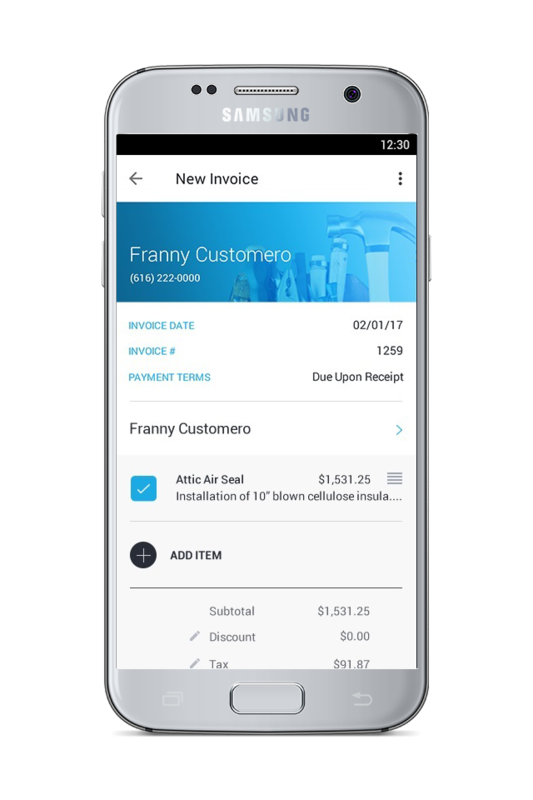 Your quotes and invoices automatically sync to the cloud, but keeping them all stored on your device was slowing the app down and taking up unnecessary space. 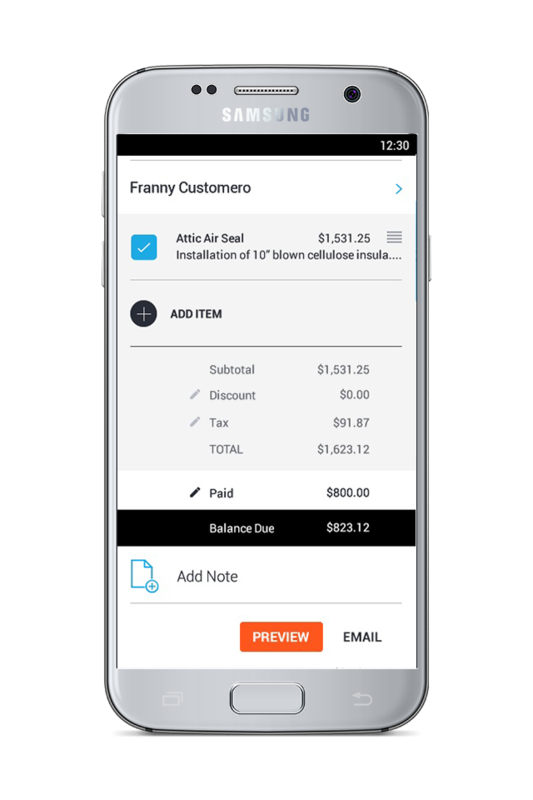 Starting in 8.2.4 your quotes and invoices will automatically be removed from the app 90 days after their last update. This can be changed in settings to increase or decrease the time it takes for them to be removed. Performing a search of the quote/invoice number or customer name, while connected to the internet, will search archived quotes/invoices and download them if the search contained no more than 10 results. There are a couple other settings that are not enabled by default. The first is defaulting new items quantity to one: when enabled and adding a new item to a quote or invoice, the items quantity will default to 1 to save time for those who don’t often deal with varying quantities. The second setting will try to keep your quotes and invoices using the same numbers. For example, If you create quote number 25 and the customer signs the quote, when you create an invoice from that quote, it will keep 25 as the invoice number if there is not already an invoice with that number. 8.2 was released with Annual Subscription options so you can pay for the whole year at 50-60% off. We also reduced the pricing of our monthly packages so if you haven’t already, go to Settings > Manage Account > Change Plan to take advantage of our new pricing. 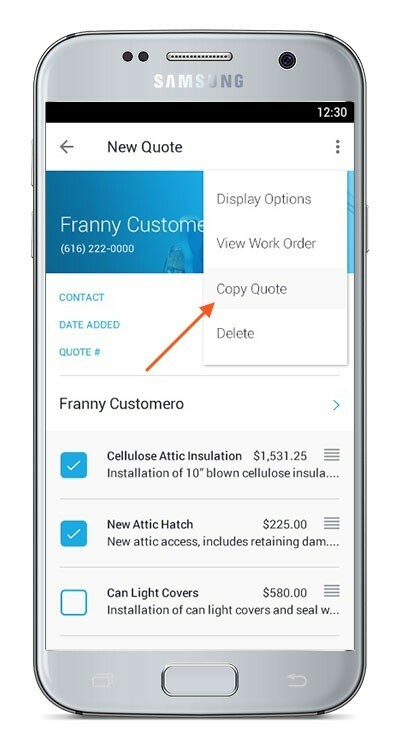 Emailing the quote to your customers now has a link which allows the customer to sign the quote online, notifying you immediately so you can complete the job and get paid faster. Reports have an updated layout to make viewing easier on your phone, the top section is collapsible so the reports can be viewed full screen. Save time modifying quotes by adding items directly below existing headings with the new Add Item icon located on each heading. Create reusable Photo Descriptions to add detailed descriptions to common photos with just a couple clicks. What’s New in JobFLEX 8.1? … Invoicing! The JobFLEX team is excited to announce the release of a quick and simple invoicing feature. And the best part? Invoicing will be included for all users, free of cost! All at no additional cost for our users! What’s New in JobFLEX v8.0? JobFLEX v8.0 has received a head-to-toe overhaul so there are a TON of new updates for you to check out. We’ve grouped them together below so you can get familiar the most important updates easily and quickly. Customers, Quotes, and Items all have their own lists now. From the menu, you can navigate to each of the lists and search, scroll, or create new from the list screens. Everything you need to build a quote is now all in one place. This allows you to build your quote in any order you want, with fewer clicks, and in less time. 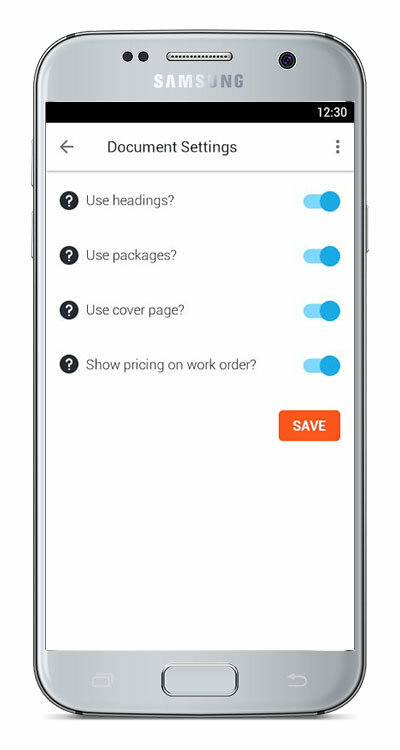 The JobFLEX app now saves and syncs your data automatically! The “Save” and “Upload” buttons on the Quote screen have gone as your changes are now saved and synced (making them available to other devices on your account) any time you leave the Quote screen. Our Basic and Pro also will no longer need the “Upload” button because the quote PDF uploads to the cloud automatically when you exit the Quote screen, preview the quote, or email the quote. You can now create multiple quotes for a single customer! Create a quote, add any customer – new or existing, and go from there. The Preview button has moved out of the way! It is now located at the bottom of the screen instead floating along the side of the screen. The “Use Headings?” toggle that was once on the Quote screen has been moved out of your way as well! If you use Headings, Packages, or a Cover Page on your quotes, you can go to Settings, then Document Settings to toggle those features ON (the app will default to OFF). Once they’re turned on, you’ll see Add Heading, Add Another Package, and/or Add Cover Page buttons on the Quote screen. This makes it easy for users who do use those features to simply set it and forget it… AND keeps the app layout nice and clean for those who don’t use the features. To make things a bit more universal, the Job Sheet is now called “Work Order” in the app. We’ve also added in the option to including pricing details on your Work Order. By default, the Work Order will only show Item Name, Item Description, Quantity, and Work Order notes. If you want the item price per unit and item total price to appear on your Work Orders, simple go to Settings, then Document Settings to toggle on the pricing for work orders. Then select View Work Order from the “more” icon on the Quote screen to generate your Work Order. The various display options that were once toward the bottom of the Quote screen have been moved. You can now go to the “more” icon on Quote screen to decide which elements you would like to display on your quotes. The app will show only Item Totals by default. Once you change a display option, it will stay on that setting for future quotes unless you change it again. If you often quote the same group of items, you can now save time by duplicating an existing quote. On the Quote screen, tap the More icon, then tap “Copy Quote”. 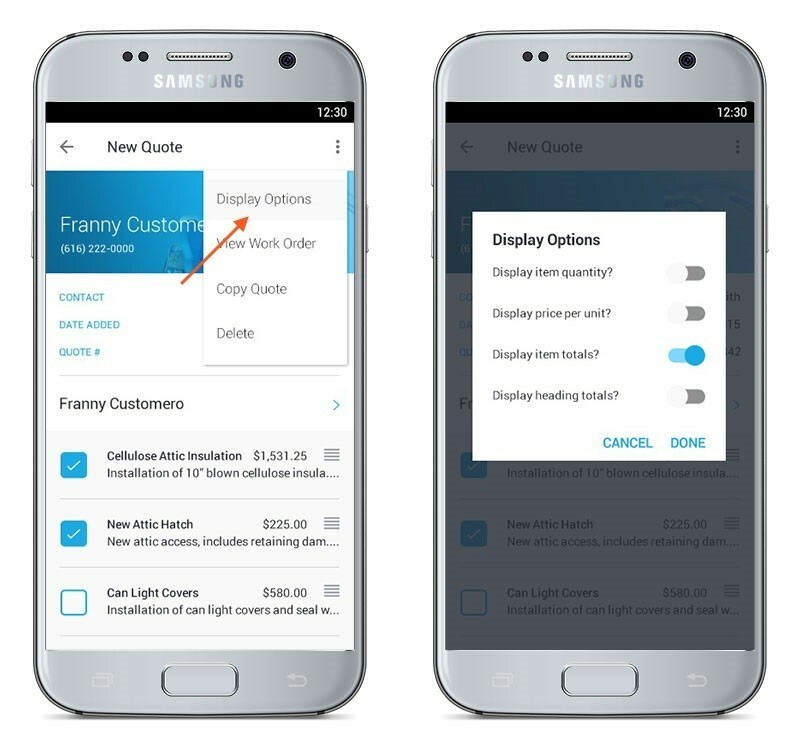 This will copy all of the items and display options to a new quote – and all you have to do is add a customer. Previously, your items only had one field for a description. Now, the app allows you to have an Item Name and an Item Description. 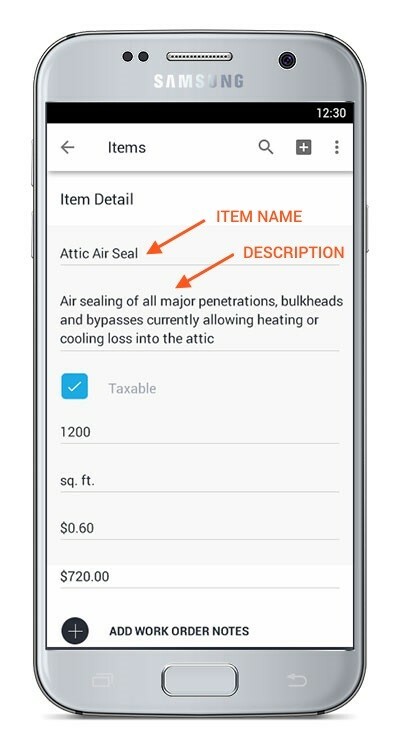 Item Name allows you to include a short, easily understood title for the item you’re quoting while Item Description is great for a more detailed description about materials used, specifications, etc. We’ve found this really helps customers to understand the scope of work more easily. Item name is required, item description is not. NOTE: This change WILL impact the items and quotes of existing users. Click here to learn how. Previously, you could mark a quote as “signed” with a checkbox at the bottom of the Quote Tab. In 8.0 that feature is called “Mark as Sold” (for clarity’s sake) and is located in the ellipsis menu at the top of the Quote screen. When you tap it, you’ll be asked to select the date the quote was sold and which package was sold if you included more than one in your quote. The Quote PDF got a little bit of a makeover! There are no big changes, just some small adjustments to make it a bit cleaner and easier to read. You can now add a note to your Quote PDF for your customers to see. This allows you to make note of anything and everything that you want your customer to remember that might not fit into a specific Item Description. You no longer have to add an item to your quote in order to apply a discount! Below all your items, you can tap the edit icon next to the word discount and apply a flat rate discount (in dollars) or a percentage discount. It’s so easy. We know our previous system for adding taxes was a pain. Now, if you mark an item as taxable, all you need to do to apply a tax rate is tap the edit icon next to the word “Tax” on the quote screen! We’ve also added the ability to use multiple tax rates for the few of you who work in areas with different rates. Our Terms and Conditions feature has a new name and more flexibility! 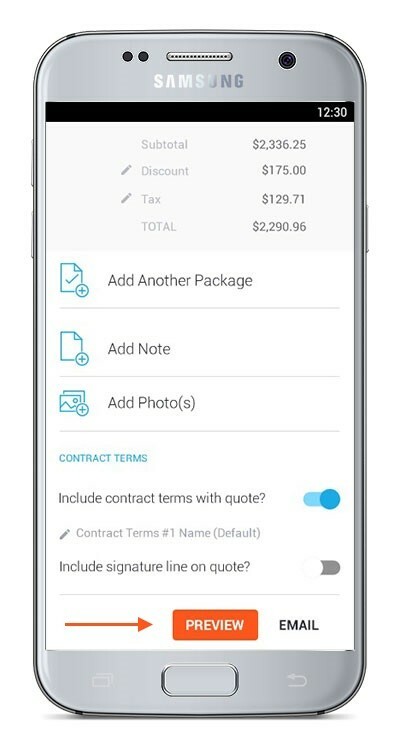 Now called Contract Terms, you can edit them for just one quote or choose to not include any contract terms with your quote. Store a lot of customer contact info in your phone’s contact list? We’ve got you covered. 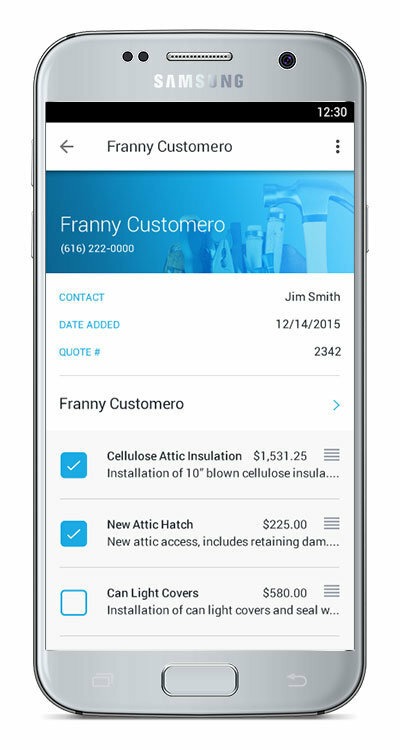 You can now use your phone or tablet’s contact list to create a new customer in JobFLEX. 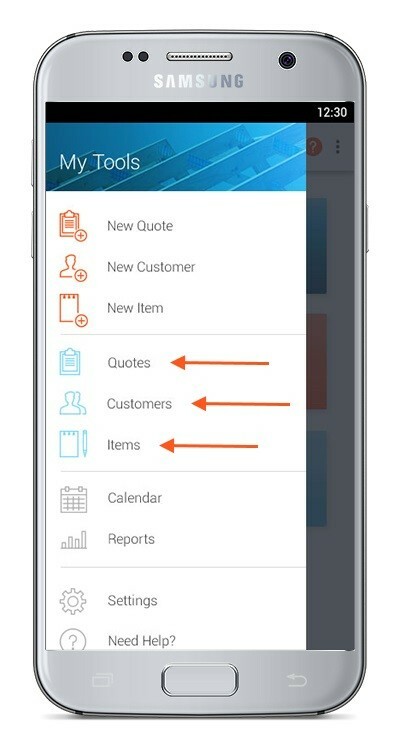 From the More icon on the Customer Detail screen, select Add From Contacts, choose the contact from your device’s list, and you’re good to go! Need to make a note about a job or a customer but don’t want it to show up on your quote? Beware of dog? Remember to bring the rebate form? You name it. JobFLEX now allows you to add Internal Notes on the Customer Detail screen. These notes can be entered via the app or via the web – and they sync back and forth so admin and field staff can see notes from one another. Reordering headings and items on your quote has never been easier. Simply press, hold, and drag it where you want it! You can reorder items and headings independent of one another – you’re no longer tied down to having items stuck under one specific heading. JobFLEX v7.1 has received some really exciting new updates to streamline the app, save you time, and make the app even easier to use. Many of our users LOVE our unique Quote Headings features, but some users wanted the feature to be optional so they could get a hang of the app before adding Headings. So we made that happen! Basic and Pro users can now sync their app to their company account in order to update Company Information, Materials List updates, Terms and Conditions changes, and other settings by tapping “Sync” on the Menu. The “Sync” feature also downloads new customers assigned to a salesperson on Pro accounts. Basic and Pro users can now search for customers that do not appear on their Customer List by utilizing the search field at the top of the Customer List. 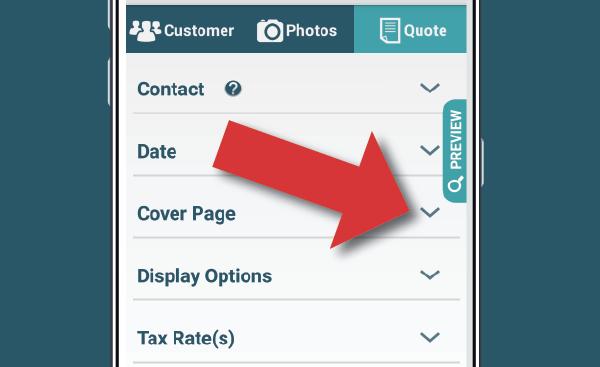 Contact name, Date of Quote, Cover Page options, Display Options, and Tax Rate(s) are now all located together at the bottom of the Quote tab. What’s New in JobFLEX v7.0? JobFLEX v7.0 has received a head-to-toe overhaul so there’s a lot of new updates for our existing beta users to check out. Check out the details below for more information on the new updates! All the customizable items and setup above is synced across all devices, so if one user makes a change, all other devices will sync (or download that changed information) as soon as they are connected to the internet. There is also a Sync option in the Menu if you would like to manually sync your device. Previously, you had to list out the items in a spreadsheet, upload them in the Cloud Manager, then download them to the mobile device(s). Now, you can also create items on the mobile device one at a time while you’re creating quotes in the field. The new items will automatically be synced to other users as soon as they have internet connection. NOTE: Don’t worry, the new Cloud Manager comes with the ability for you to indicate which users, if any, you want to allow to add or edit the Materials List items. You no longer have to use a category to create a Materials List item. Uncategorized items appear in the drop-down list on the app in plain text while categories appear in bold text. There is now a “See All” option that allows you to view all items in your material list at once in the drop-down list to make it easy to find categorized items if you’ve forgotten which category they’re in. There is now a search bar at the top of the Customer List to make it easy to find customers on your device. NOTE: Customers whose appointments are more than 2 weeks in the past or 2 weeks in the future cannot be located using the search bar on the Customer List. You must go to Download Customers from the Menu and search for those customers by name in order to pull them to your device. Customers are now ordered by date of scheduled appointment (instead of alphabetically), making it easier to see your upcoming appointments. The scheduled date is also displayed under customer information. You can now re-order your Quote Headings (formerly known as Services) and/or Line Items by tapping and dragging them into the desired order, instead of numbering them. You can now manually enter the quantity for each Line Item instead of using a drop-down box. You now have the ability to select which app on your device you would like to choose your photos from. For example, you can use Gallery, Dropbox, Google Drive, Photos, etc. You are no longer limited to selecting only from your Device Storage/SD Card. You can now re-order your Photos by tapping and dragging them into the desired order, instead of numbering them. The option to include photos in the quote is now selected by default – meaning you will need to uncheck any photos you do NOT want on the customer’s quote. You now have the ability to include tax, so if the item was marked as taxable on the material list then it will be taxed at the rate selected. All tax rates must be added in the settings on the app or on the Cloud Manager. The job sheet is now only available if you mark the quote as signed. This is a result of confusion when there are multiple package options available. Package 2 and 3 are auto-collapsed to reduce the amount of scrolling necessary on the Quote tab. The quote format has been entirely redesigned for a cleaner, more brand-neutral feel. The colored shading is now light gray, the quantity column has moved, the photos are all aligned on the left of the page, the company motto has been removed, and totals are now in bold print where appropriate. The Schedule Tool is now called the Calendar. The construction man icons, indicating additional settings areas, are now gear icons. All customers generated on a mobile device are now automatically accepted as new customers in Cloud Manager, unless the first and last name are identical to another customer already in Cloud Manager. If a duplicate is recognized by Cloud Manager, they are tagged as duplicates and must be merged. The icon for a duplicate is a red exclamation point and you will see this on your dashboard as well as in the Customer Information area. You will not be notified via the app of any duplicate customers. Job numbers are no longer available. Quote numbers are still available, though. On the Customer Information box, the “Update Customer Information” button was changed to “Save”. Tax Rate is a new settings page. You can add multiple tax rates here if needed. The app allows you to select which (if any) tax rate you would like to apply for each quote you create. Finance Rate is a new settings page. You can set the rate used to calculate monthly payments if you offer financing to your customers. The app allows you to show/hide finance rate for each quote you create. Manage Resources is a new settings page. This allows you to create resources, such as crews and equipment, that are then available to assign to a customer task. The materials list template is much easier to use! The min, max, and custom increments for quantity have been removed so now you will have to enter the quantity for line items in the app instead of selecting one from the drop-down. The units per package and package units columns were removed as they were too complex for the needs of our users. The notes column of the Materials List now shows up on the Job Sheet. This allows users to have assembly/detailed descriptions of the product without the customer seeing it on the quote. A column was added to allow you to mark a product or service taxable. To mark an item as taxable in a spreadsheet for upload, type a 1 in that column. To mark an item as taxable using the editor in Cloud Manager, check the box in the editor. You can now mark a contract signed or unsigned from the File Directory. The JobFLEX Calender is now integrated with Google Calendar so all of your appointments, tasks, and notes can be viewed on a Google Calendar, effectively making the JobFLEX Calendar mobile-friendly. This communication is, although, a one-way street… so if you change a JobFLEX appointment on your Google Calendar, it does NOT change on the JobFLEX Calendar. Some of the Calendar icons have changed and there is now a legend on the Calendar explaining what each icon means. You can hover over each icon to see a description. You now have the ability to create a task and assign resources to that task. 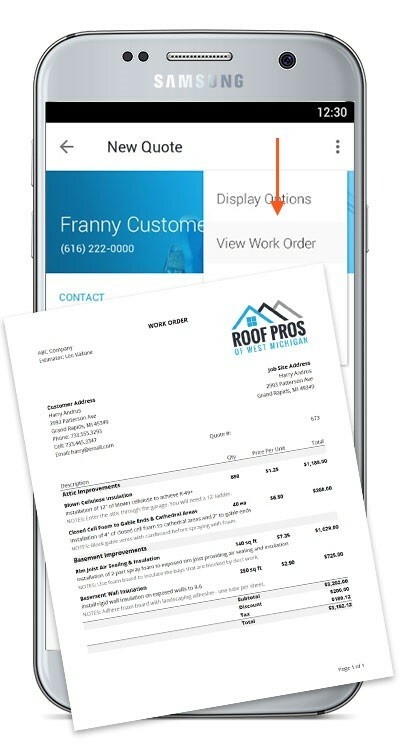 For example, I have a customer that has signed a contract for a new roof, I can now assign a crew and equipment that task and it shows up on the JobFLEX Calendar (and Google Calendar, if you want). The JobFLEX team realizes this is a massive list of updates, upgrades, and enhancements so if you have any questions or need any assistance familiarizing yourself with the new version release, please don’t hesitate to contact us. This version is the Beta Release of the JobFLEX app. Future changes and feature additions will be listed with new version releases.